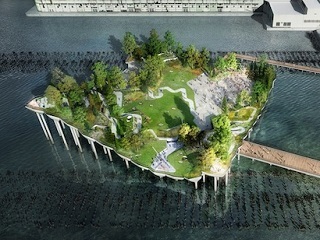 In her debut column, Alexandra Lange takes a hard look at Barry Diller's proposed Pier 55 project. Lange’s essays, reviews and features have appeared in Architect, Domus, Dwell, Metropolis, New York Magazine, The New Yorker blog and The New York Times and T magazine. She taught architecture criticism in the Design Criticism Program at the School of Visual Arts and the Urban Design & Architecture Studies Program at New York University. During academic year 2013–2014, she was a Loeb Fellow at the Harvard Graduate School of Design. The addition of Lange comes on the heels of Curbed’s recent hire of Asad Syrkett as the site’s national editor. Both additions are the first staffing moves made by Kelsey Keith, who joined Curbed in March as the site’s first EIC. Syrkett came to Curbed from Architectural Digest, where he was an editor.